Jennifer Jambon is a Perfumer at Molton Brown. Born c. 1978 in France, she earned a Masters Degree in Flavour and Fragrance, Le Hebre (1998-2000) before attending ISIPCA (2000-2003). 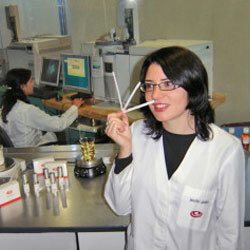 She trained at Firmenich (2000-2001) and worked quality control at Givaudan (2000). She worked as an odour evaluator at IFF (2002), a perfumer assistant at Mane, and a junior perfumer at Cramer in Santiago, Chile (2006-2008) before joining Molton Brown in 2009. In 2008 she won the French Society of Perfumer's Prix International du Parfumeur Createur, awarded to young perfumers (under 35), for her fragrance, Promenade. Jambon has created fragrances for Molton Brown.